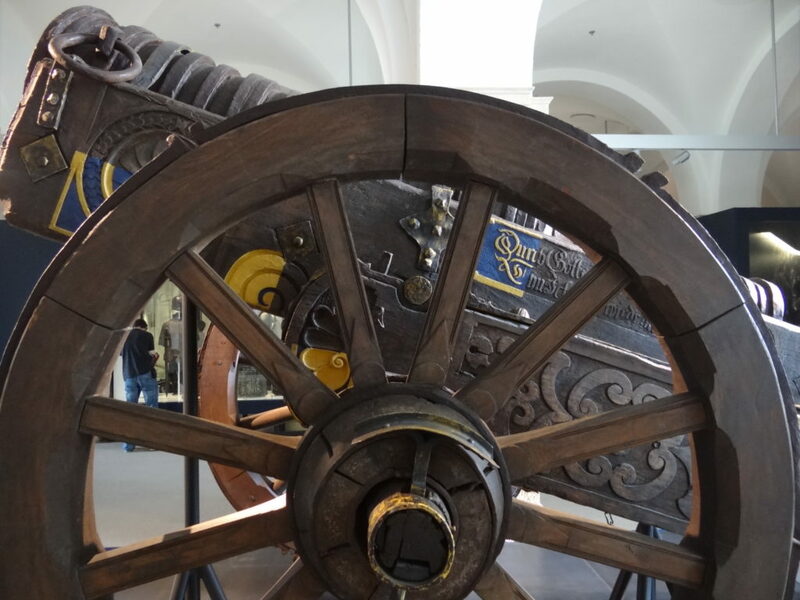 The “Faule Magd” (Lazy Maid) of Dresden is one of only a few dozen still extant medieval bombards, and one of the most notable due to its well-preserved wooden carriage. At the time of writing, in July 2018, it is on exhibition in the Militärhistorisches Museum der Bundeswehr in Dresden, Germany. 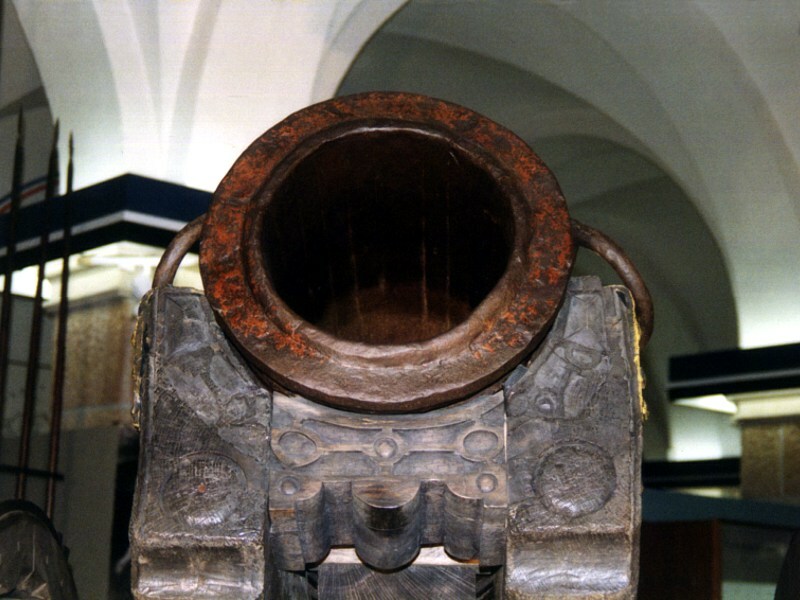 The barrel exhibits the typical features of a gun made in the late medieval period; it is assumed that it was manufactured in Saxony between the years 1410 and 1430. Twenty iron staves were aligned around a wooden inner form-work ‘core’ and held together by iron bands. These were slipped over the staves whilst red hot, shrinking as they cooled and tightening the staves of the barrel in place, the core then being removed (see Figure 1.1). 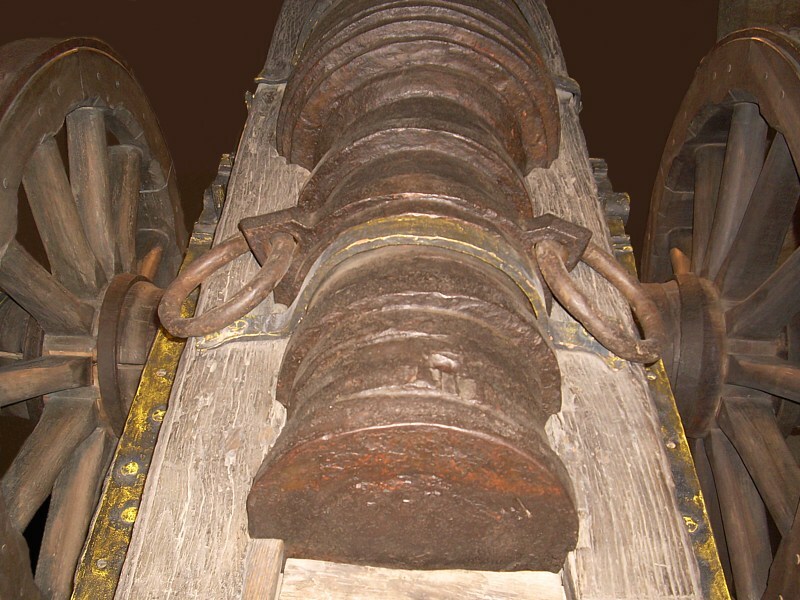 This rudimentary construction method is also seen on guns with wooden barrels, but was quickly replaced with cast guns when technology allowed. Figure 1.1 The inside of Faule Magd’s barrel. Note the twenty iron staves that form the barrel walls (source: Andreas Stasiak). The overall length of the barrel is 2330 mm and it consists of two parts: the so-called flug, the barrel proper, of 1485 mm in length and 345 mm in diameter; and the powder chamber, of 765 mm in length. 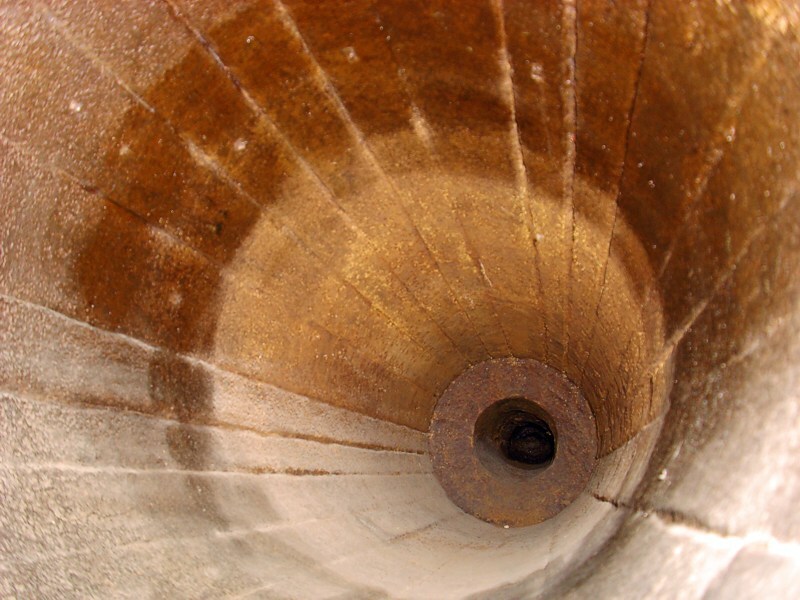 The combined powder chamber and breech-block has a reduced diameter relative to the barrel (145 mm) which was intended to ensure that the expanding gasses pushed the stone cannonball at its centre point, improving the range and accuracy of the gun (see Figure 1.2). Figure 1.2 The powder chamber/breechblock, of reduced diameter (source: Andreas Stasiak). Originally Faule Magd was designed and used as a legestück, a functional but largely immobile configuration. The barrel was laid on a wooden frame and tied down with ropes and iron chains. Once in place, the assembly was typically used from a fixed position, requiring considerable time and effort to relocate. 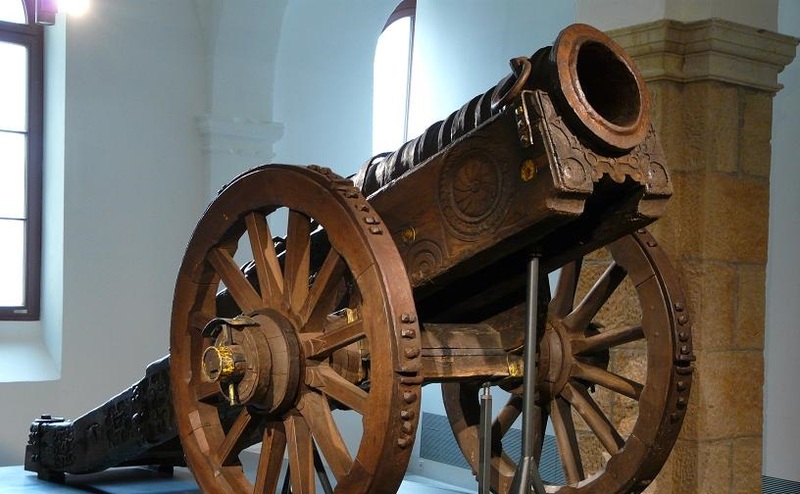 In 1511, the gun was fitted to a carriage made of sturdy oak wood – the whole assembly now had a length of 4.37 m and was 2.22 m wide. The gun is muzzle-loaded, firing stone projectiles of approximately 345 mm diameter (see Figure 1.3) and 48 kg out to at least 500 m.
Figure 1.3 The muzzle of Faule Magd (source: Andreas Stasiak). The carriage was and important artistic and technical masterpiece for its time. Since the barrel was designed as legestück, there were originally no trunnions – a design feature was most likely invented in the late 15th century in Burgundy – integral to the gun. The craftsmen producing the carriage skilfully solved this problem by making the carriage out of two parts: the frame (‘walls’) and wheels of the carriage, and the so called lade, or cradle. This cradle provided a solid wooden base onto which the barrel was fixed. The wooden base itself had trunnions, so that the entire assembly could be elevated (see Figure 1.4). This two-part carriage design was rendered obsolete when guns were cast with integral trunnions for the next several centuries, but the concept made a reappearance in the late 19th century, when ironworks in Europe developed a working recoil mechanism using similar principles. 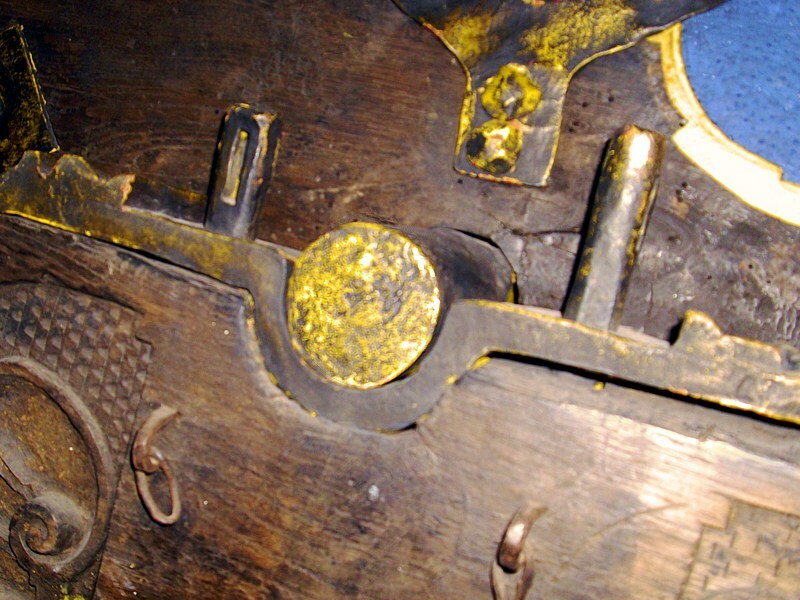 Figure 1.4 Detail of Faule Magd’s carriage. Note the two-piece construction and trunnion (source: Andreas Stasiak). The impressive carriage of oak also performed symbolic functions. Whereas guns of the Renaissance and later periods were cast and featured highly ornamental designs – often copied from Renaissance architecture – to demonstrate the wealth and status of those who commissioned them, there were design limitations on the wrought iron guns of the early Middle Ages. The need for representation of ownership was overcome by intricately decorating the carriage of the weapon. The side and front walls of Faule Magd’s carriage show intricately engraved decorative patterns and inscriptions (see Figure 1.5), originally painted in blue and yellow. Metal fittings to the carriage were also painted yellow. 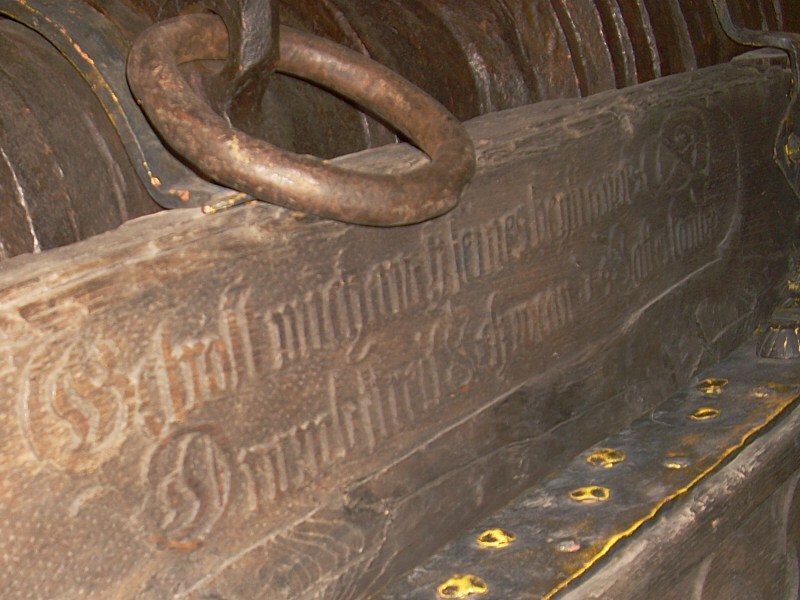 Figure 1.5 Inscriptions on Faule Magd’s carriage (source: Andreas Stasiak). The fortifications of central Germany improved only a little through the late Middle Ages. In practice, the largest and richest cities like Nuremberg adopted the Italian ‘bastion system’, and therefore an antiquated bombard firing stone projectiles remained of some use on the battlefield simply due to its substantial size. When many items in the Saxon Armoury were sold in the 19th century, Faule Magd somehow avoided this fate. It survived in the Armoury as an oddity and an anachronism. The pieces of the Saxon Armoury later formed the founding collection for the military museums of Saxony, the DDR, and most recently the Militaerhistorisches Museum. The lazy maid has grown naturally into the present-day collection. It remains unknown who commissioned this gun. The blue and yellow colours displayed on the carriage could indicate that it was commissioned by either the city of Leipzig or by the county of Lausitz, both of whom have traditionally used these colours. 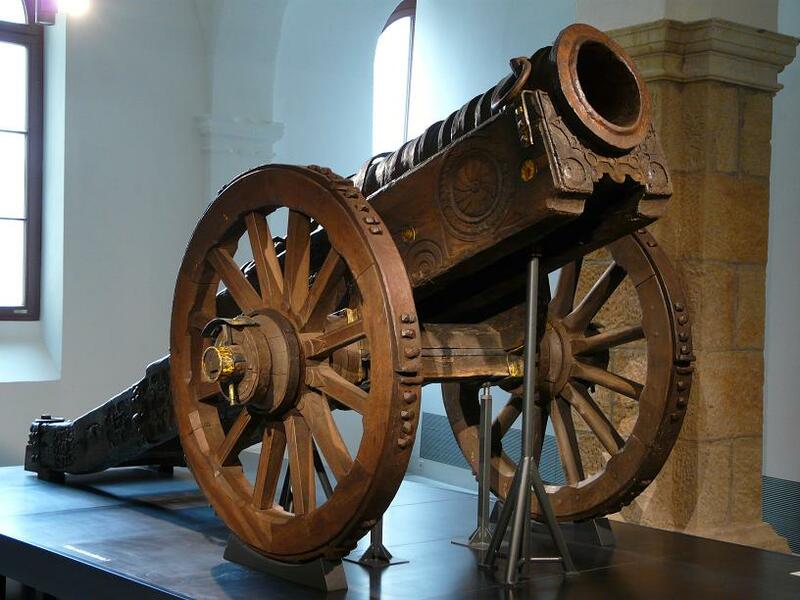 This former theory is partially supported by a record which indicates that, in 1637, a gun called “Faule Magd” was used successfully by the city of Leipzig against Swedish forces during the Thirty Years’ War. Nonetheless, it is not conclusively known whether Faule Magd ever fired a shot in anger. Figure 1.6 Faule Magd and its carriage (source: Adam Jones/Wikimedia). Similarly, little is known about the origins of the name. It is presumed that the same name may have been shared by several guns of this type; heavy bombards tended to bear names which spoke to their slow reloading times. It may be that, as its sister guns slowly disappeared in the fog of history, “Faule Magd” became the proper name of just one gun. Heuser, F. 2004. Militärhistorisches Museum der Bundeswehr in Dresden 7 Hinterlassenschaften aus fünf Jahrhunderten. Dresden: Armeemuseum der DDR. “Faule Magd”. Dresden: Armeemuseum der DDR. Lachmann, M. & M. Springer. 1979. Militärtechnik und Gesellschaftsordnung. Das Geschützwesen im Kurfürstentum Sachsen. Dresden: Armeemuseum der DDR.